The Destiny 2 Warlock is back in the sequel with a new Dawnblade subclass, and can generally control the battlefield through a number of new and unique abilities. This guide will walk you through everything you need to know about the Warlock's new Voidwalker, Stormcaller, and Dawnbreaker subclasses and new Super Abilities. If this wasn't what you were after, then head over to our Destiny 2 guide hub, containing a hub of knowledge on the Hunter and Titan classes, as well as a general roundup of every Exotic and Legendary weapon we've seen in the game so far. Here, we have a complete walkthrough on every single subclass you can unlock throughout the course of Destiny 2 for the Warlock, as well as all the new and returning Super Abilities for every subclass, including Dawnblade, Voidwalker, and Stormcaller. To unlock the second and third Warlock subclasses in Destiny 2, you'll need to keep an eye out for any side missions you can undertake near the Shard of the Traveler in the European Dead Zone. When available, these missions will let you take down a horde of Fallen using the Super Ability of the brand new subclasses you're trying to unlock. It doesn't take more than a few minutes to complete, and it's effectively a basic tutorial area for your new Super Ability. Healing Rift - Allows the Warlock to produce a circle of light, which gradually heals the player and all their allies inside the radius of the circle. Empowering Rift - Alternatively, you can produce the same circle of light, that this time boosts the attack power of all players inside the circle, instead of healing them. L1+R1/LB+RB - Hurl an explosive bolt of Void Light, disintegrating all enemies caught in its blast. Blink - Allows the Warlock to teleport forward a few meters, which should be handy for dodging incoming attacks. Strafe Glide - Glide through midair after jumping with strong directional control. Burst Glide - Gain a strong initial boost of speed through the air after jumping. Scatter - Produces one large grenade which then explodes into smaller grenades, covering a wide area in the process. Vortex - Creates a Vortex which continually damages enemies trapped inside it. Axion Bolt - Bolt of Void Light which splits into smaller bolts which seek out enemies. Chaos Accelerant - Hold left shoulder button to draw energy from your Super Ability to overcharge your grenade, making it deadlier. Bloom - Void ability kills cause enemies to explode. Cataclysm - Nova Bomb seeks out enemies, fire your weapon at the bomb to detonate it earlier. Entropic Pull - Strike an enemy with your Melee to recharge your grenade. Devour - Killing an enemy with this Melee ability fully restores your health. Feed the Void - Hold left shoulder button to consume your Grenade energy and regenerate your health. Insatiable - While Devour is active, killing an enemy extends its duration and recharges your Grenade. Vortex - Nova Bomb creates a spot that continually damages enemies trapped inside. 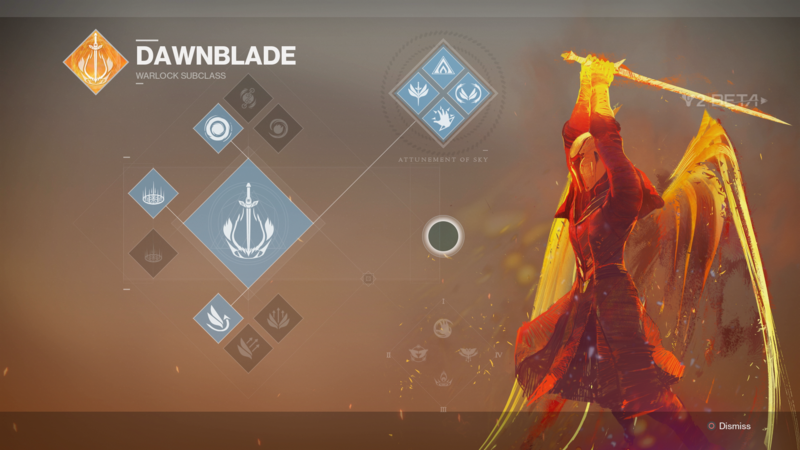 The Dawnblade subclass looks to replace the Sunsinger subclass from the original Destiny, allowing the Warlock to weave massive blades of fire through the air. L1+R1/LB+RB - Weave Solar Light into multiple blades, striking enemies from midair. R1/RB - Throw Solar Light blades at enemies. Balanced Glide - A combination of moderate speed and directional control in midair. Solar Grenade - Creates Solar Light, and continually damages those inside of it. Firebolt - Unleashes bolts of Solar Light at nearby enemies. Fusion - An explosion that deals bonus damage if attached to a target. Winged Sun - Fire weapons and throw grenades while gliding. Heat Rises - Kills while airborne recharge your Grenade and Melee Energy. Icarus Dash - Double press Circle/B while airborne to dodge. Swift Strike - Strike an enemy to burn the target and temporarily increase your movement and reload speed. Igniting Touch - Strike an enemy to burn them, and then cause them to explode when killed. Fated for the Flame - Daybreak projectiles seek targets as they travel. Everlasting Fire - Killing an enemy with Daybreak extends its duration. Phoenix Dive - Hold Circle/B while midair to quickly descend and regain health. The Warlock's Dawnblade ability looks to both heal and boost the surrounding teammates, as well as being able to deal significant damage through the Daybreak Super Ability. The Warlock is more of a supportive class in Destiny 2, but it's good to know that the class isn't all support with Daybreak and Grenade abilities. 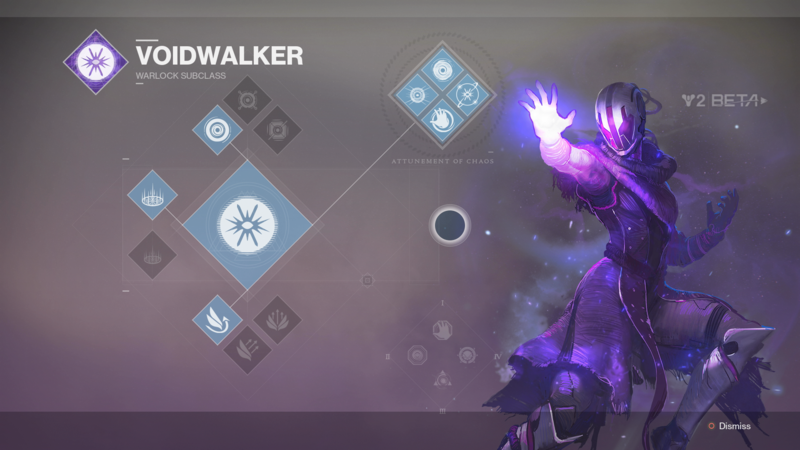 The Warlock Stormcaller subclass is making a comeback from the original Destiny, carrying a focus on mainly Arc Lightning, besides from other elemental powers. L1+R1/LB+RB - Summon Arc Lightning in your hands. R1/RB - Fire repeated blasts of Arc Lightning from your hands at your enemies. Controller Glide - Glide through midair after jumping with strong directional control. Focus Burst - Gain a strong initial boost of speed through the air after jumping. Firebolt Grenade - Unleashes bolts of Solar Light at nearby enemies. Fusion Grenade - An explosion that deals bonus damage if attached to a target. Chain Lightning - Delivers a single Arc Lightning melee strike, that then chains to nearby enemies. Transcendence - Stormtrance lasts longer if cast with full grenade and melee energy. Arc Web - Enemies damaged by your grenades chain Arc Lightning damage to nearby enemies. Ionic Blink - While in Stormtrance, press the sprint button to teleport. Gale Force - This Arc Lightning melee ability hits at range, and restores your grenade and melee energy. Landfall - When you cast Stormtrance, a wave of Arc Lightning shoots out to the ground beneath you. Rising Storm - Your Rift ability charges faster while allies are nearby. Arc Soul - Your Rift ability now grants you an Arc Soul ally in battle.